To get the best experience in your workshops it is very important to read this page of helpful information. It contains my fee requirements, classroom information, and information for students and organizers. If you have any questions, please contact me. 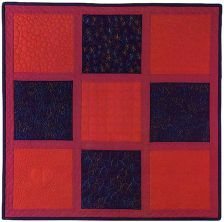 In this basic workshop, learn all aspects needed to master machine quilting. Start with a discussion on machine quilting supplies, including thread, needles and notions. Next, practice the basic techniques of straight line and free motion machine quilting on small quilt packages. After learning the skills to feel confident with these techniques, Sue will demonstrate how to successfully baste; package and machine quilt the actual quilt. Go home feeling confident to quilt any size and style quilt. Many quilts will be shown for inspiration. With Sue’s patient guidance learn all the basic skills needed to master machine quilting on your home sewing machine. In this basic workshop, learn all aspects needed to master machine quilting. 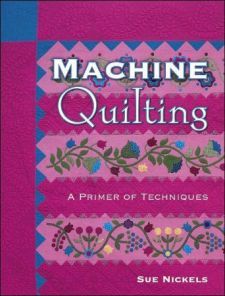 Start with a discussion on machine quilting supplies, including thread, needles and notions. Next, practice the basic techniques of straight line and free motion quilting on small quilt packages. 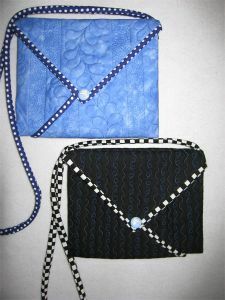 After learning the skills to feel confident with these techniques, students will quilt a small piece that can be made into a unique little bag! Learn to successfully baste, package and machine quilt the actual quilt. Go home feeling confident to quilt any size and style quilt. With Sue’s patient guidance, lean all the basic skills needed to master machine quilting on your home sewing machine! Machine Stipple Quilting and Much More! 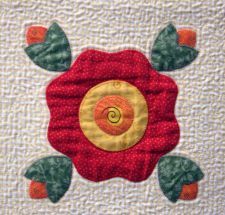 In this all day workshop, free motion quilting will be explored for background areas on your quilt and for overall surface designs. 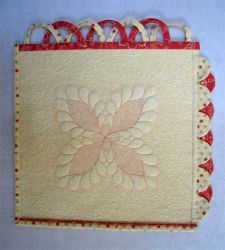 Traditional stipple quilting will be covered as well as many fun alternatives. Some of the variations include: loopy meandering, psychedelic stippling and curvy crosshatching. Students will make a small stipple sampler to showcase these techniques. 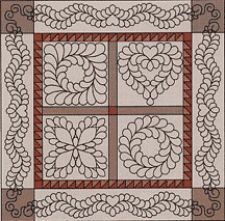 If you are looking for ways to make your machine quilting different from the crowd, this will inspire you. 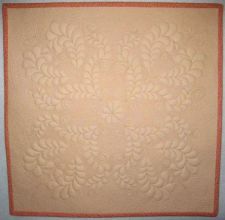 Some basic free motion quilting skills will be reviewed, then jump into the fun! In this workshop explore machine quilting using traditional quilting designs. 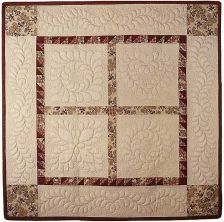 Sue’s inspiration for choosing quilting designs comes from antique quilts keeping with the traditions in quiltmaking. Feathers, cables and motif designs will be covered as well as stipple quilting and crosshatching for background areas. Discussion will include thread choices, batting selection and handling the larger quilt project. This is a great choice for students who are interested in adding to their machine quilting experience. With Sue’s expert guidance learn to become more confident with free motion machine quilting and enjoy the process. This workshop will focus on beautiful feathers, from drawing your own feathers to free motion quilting with ease. First, explore the techniques Sue uses to custom design her feathers. It is easier than you think! Next, learn to control your stitching successfully to create your own free motion feathers on the machine. Practice will make perfect as you stitch on practice samples. Also covered in a demo format, Sue will show her approach to marking, basting and quilting the actual quilt. At the end of the day, feel confident to design and free motion quilt fabulous feathers! In this workshop explore the beautiful feather design and how to enhance it with traditional stipple quilting. 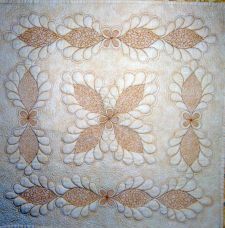 Sue has used the feather design successfully on many of her quilts and uses traditional stipple quilting to add dimension. The feather is the ideal design for free motion quilting and is easier than you might think. Students will work at the machine on a small feather project that Sue has created just for this workshop. Fall in love with this fabulous combo- Feathers and Stippling! In this workshop, explore the beautiful feather design. 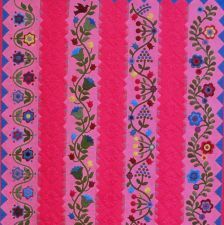 Sue has used the feather design successfully on many of her quilts. The feather is the ideal design for free motion quilting and is easier than you think. Sue has been easily designing her own whole cloth feather patterns and will share the techniques. Students can then design their own unique feather project or use Sue’s designs. Move on to learning the skills to successfully free motion quilt these great designs! Fall in love with Feathers! In this workshop explore the options for quilting the appliqué quilt. Outline, echo quilting and designs to enhance this quilt type will be explored. Stipple quilting for the background areas will be covered as well as other interesting options. 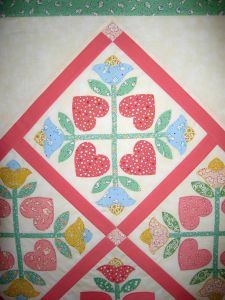 Also, see what can be added within the appliqué shapes to enhance the quilt. Surface embellishments will be introduced to add interest and texture to the quilt. 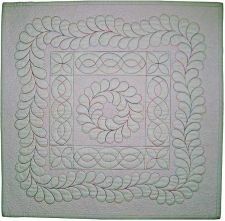 Students will work on two practice appliqué blocks to learn these techniques. If you love appliqué and have always wanted advice on how to quilt your quilt, this is a perfect workshop for you. Learn all about stitched raw edge machine appliqué in this informative workshop. 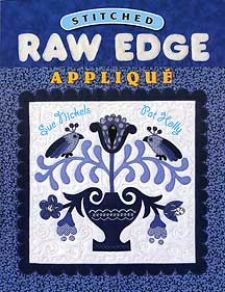 Sue’s book “Stitched Raw Edge Appliqué” co-authored with her sister Pat Holly is the basis for this class. A small amount of fusible is used to seal the edge yet leaves the block soft. The machine blanket stitching makes this project secure for washing. Students will work on a practice sampler of ideas in class to learn the technique. Explore the details of inside and outside points, curves, circles and a great bias stem option. This is a technique class which allows time to explore the details of the technique. Feel confidant to work on any appliqué pattern after taking this class! Learn all about easy machine appliqué in this great little project. A small amount of fusible is used to seal the edge yet leaves the block soft. The machine blanket stitching makes this project secure for washing. Students will work on one block in class to learn the technique. Explore the details of points, curves, and a great bias stem option. This quilt looks perfect in 30’s prints, but can be done in your favorite fabrics as well. Students will receive the block pattern and instructions to complete the small project. In this workshop learn how to appliqué using a quick raw edge fusible machine technique. Ashley’s Flower Basket, the first pattern in a series of flower basket designs Sue created for JWD Publishing will be used in this workshop. Learn the fine points of machine appliqué including perfect points, neat curves and creative surface embellishments. 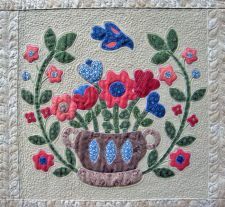 This technique is the focus of the AQS book “Stitched Raw Edge Appliqué” co-authored by Sue and her sister, Pat Holly. Quality workmanship is the priority in this workshop! In this workshop learn how to appliqué using a quick raw edge fusible machine technique. Ashley’s Flower Basket, the first pattern in a series of flower basket designs Sue has created for JWD Publishing will be used in this workshop. Learn the fine points of machine appliqué including perfect points, neat curves and creative surface embellishments. 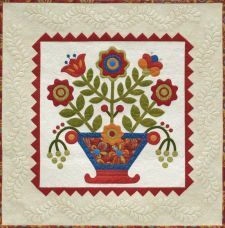 This technique is the focus of the new AQS book “Stitched Raw Edge Appliqué” co-authored by Sue and her sister, Pat Holly. Quality workmanship is the priority in this workshop! Explore the details of this great fusible machine appliqué technique. Students will work on one block* from Sue’s quilt “Morning has Broken” featured in the AQS book “Stitched Raw Edge Appliqué” co- authored by Sue and her sister Pat Holly. Really sharp points, reverse appliqué, embellishments and other details will be covered. Embellishing the background will also be an option for students on this block. Learn the machine skills used by Sue and Pat for their award winning quilts “The Space Quilt” and “The Beatles Quilt. *Please note- Students will receive the pattern for the center block only, books will be available to purchase for the remaining patterns for this quilt. Learn machine appliqué using an easy raw edge fusible technique that is perfectly suited for the smaller more intricate style associated with Baltimore album blocks. 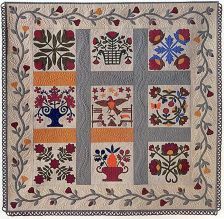 This project features folk art inspired designs reminiscent of the beautiful quilts made during the 19th century. Students will receive one pattern and will work on this one design in the workshop. Additional patterns will be available. Sue and her sister, Pat Holly, have been inspired by the this folk art style of appliqué quilts to create their award winning “The Beatles Quilt” and “The Space Quilt”. 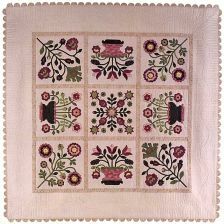 Learn the same techniques they have used in these modern Baltimore style quilts in this wonderful workshop. Focus on quality workmanship that never compromises quality for speed! In this half day workshop learn how Sue stitched the fabulous scalloped edge on her award winning quilt “Le Panier de Fleurs”. 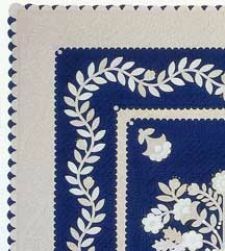 This edge has received much attention since the quilt appeared in shows in 2000. Students will make a practice piece to learn the drafting, stitching and placement along the edge of the quilt. This technique is featured in Sue and her sister Pat Holly’s new book, “Stitched Raw Edge Machine Appliqué” from AQS. Take the mystery out this attractive and classic finish. As a bonus Sue will demonstrate the creative loopy edge treatment also featured in the new book! In this half day workshop, explore the techniques Sue uses to custom design feathers. Do you want to free yourself from using stencils and tracing your feathers from books? Have you always wanted to draw your own designs? Sue will show you how she easily designs original feathers, it is easier than you think! Let Sue walk you step by step through the design process and make feathers that fit the exact size of your quilt. Also, learn about the latest marking tools to easily mark on your fabric. Machine Quilting: A Primer of Techniques by Sue from AQS features some of Sue’s feather designs. Beginner/Intermediate - 2 day only! Sue and her sister, Pat Holly, incorporate unique finishes for their collaborative quilts as well as their own personal quilts. Learn how to create these unique finishes for your own quilts. Start the workshop with Sue’s expert techniques for free-motion machine quilting your mini-quilt. This mini-quilt will then be used for practicing these creative finishes. Sue will step by step take you through the unique scalloped edge and in demo format learn traditional bindings, piped bindings, and a wonderful loopy edge binding. Your mini-quilt will be a reference for future projects. Sue will share through slides her progression from hand quilter to the machine quilter she is today. This personal journey includes slides of Sue’s quilts and her sister, Pat Holly’s quilts as well quilts from machine quilters who have influenced the current machine quilting trends. Sue will bring a selection of her quilts to share and provide time for discussion at the end, so bring your questions about machine quilting. In this lecture, Sue will share the unique way she and her sister, Pat Holly, collaborate on their award winning quilts. Share Sue and Pat’s history in quilting through slides of their collaborative quilts including “The Beatles Quilt” and “The Space Quilt”. Sue will bring quilts to share and allow time for questions. In this informative lecture Sue will discuss the history of the sewing machine and it’s place in the quilting world. Learn about the importance of the sewing machine to the homemaker. See the early quilts that incorporated this first home appliance and how early quilter successfully stitched on their machines. Sue will have some of her own quilts to share as well as discussing how she successfully machine quilts on her home sewing machine. All text and images © copyright Sue Nickels.